No written directions provided. Refer to the map above. Beautiful forest scenery. watch for deer at dusk. Nice camping spots. Awesome waterfalls. Great ride. good road for about 20 miles but turns to gravel after that. we always either camp their or ride in and ride out. Also several drive ways that "drag" gravel out into the road so have to watch for that. This is a windy twisted road. enjoyment for cruisers, touring bikes and great for sport/touring bikes. No gas stations or restaurants but their is camping. you are only 15-20 or so miles from wenatchee at the entrance of entiat river road. No offence to the originator; this is a challenging ride to rate due to confusion. There are no written directions and the map route doesn't match the description. The map shows a route from Grand Coulee all the way to a forest road starting in Entiat. Not counting the forest road, Grand Coulee to Entiat is roughly 100 miles. The description only claims a 20 mile route. That's a pretty big discrepancy. My review will focus on the paved sections (the majority of the map route). 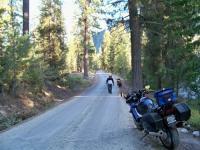 Generally, this route follow the mighty Columbia River with a brief peel off to the vacation destination of Chelan. The road conditions along the highways are generally good. There are sweeping views of the river and the riverside towns sprinkled along the banks. The backdrop is full of rocky hills which are sparsely populated with hardy-looking shrubs and trees. This is not the lush, green landscape Washington is often known for, but it is still beautiful with its iconic rough-and-tumble appearance of the untamed American West. The man-made marvel of Grand Coulee Dam should be thoroughly explored. The Visitor Center is free and a laser show is displayed most nights using the dam as the screen. Plenty of restaurants and motels are located around the dam. Be sure to take the short drive up to Crown Point - a lookout just northwest of the dam. This provides a spectacular view of the entire valley and good opportunity to get a pic of the bike and dam together. Chelan and Lake Chelan are the destination of many summer vacationers. Activities and lodging abound in this area as well as beautiful views of the water.